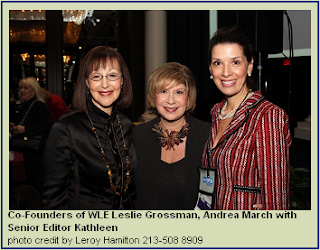 Close to 750 successful women attended The Third Annual Women's Leadership Exchange Conference which was held at the Sheraton NY Hotel and Towers on Thursday, November 3, 2005 from 7:30 a.m. to 7:30 p.m.WLE was co-founded by Leslie Grossman and Andrea March just a few years ago. Both of these savvy successful ladies put their combined 28 plus years of business experience to create the "girls' club for women who want to increase their businesses from the million dollar mark to making millions. As "serial entrepreneurs who have reinvented themselves many times over, Leslie and Andrea came to recognize that female business owners too often became stuck at the million dollar mark, with research showing that female business owners didn't know how to jump to the next level. Leslie and Andrea further observed that there were no networking organizations catering to female business owners. WLE was created to address these needs.Leslie and Andrea skillfully designed a full-day conference for business owners who want to break through and make their current business into a million-dollar-plus business. The all day event included seminars, informational/motivational speakers, while fostering networking opportunities among the women by matching companies of the same size. Participants were able to gather information about branding, leadership, financing, growth strategies, marketing, and conflict resolution all in one day that will carry them through there remainder of the year and beyond. WLE has already held similar conferences in Dallas, Chicago, Southern California and Atlanta. The event started with WLE Program MC Barbara Laskin, the founder and President of Laskin Media, Inc. introducing Leslie and Andrea to everyone. Special surprise guest Mayor Michael Bloomberg, a highly successful business entrepreneur before his election as mayor, who thanked his mother for his work ethic - a critical foundation upon which to build success. 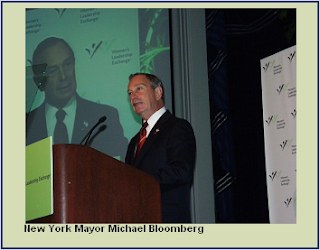 As Mayor Bloomberg acknowledged, "My mother always told me, you can achieve anything when you put your mind to it. Singer/songwriter Sonia sang the hit song by Christina Aguilera "You Are Beautiful". Some of the other illustrious speakers were Morning Keynote Speaker Sara Blakely, Spanx Founder & Owner. 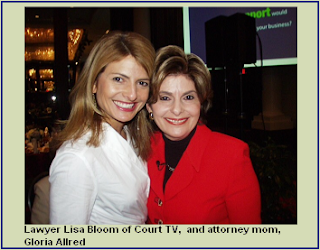 Gloria Allred, the Leading Women's Rights Attorney, was the Luncheon Keynote Speaker. Edie Weiner, World-renowned Futurist and Author, Future Think: How to Think Clearly in a Time of Change was the afternoon speaker. Closing Keynote Speaker was Karen Elliott House, Publisher, The Wall Street Journal.Additionally, Compass Awards were presented to three extraordinary women: Ella L.J. Edmondson Bell, an author, managerial consultant, nationally recognized researcher and advocate on women?s work place issues; Susan Sobbott, President of OPEN from American Express, the team dedicated exclusively to serving small business owners; and Linda Kaplan Thaler, CEO and Chief Creative Officer of the Kaplan Thaler Group. Seminars were led by Aldonna Ambler, Founder, Ambler Growth Strategy Consultants, Inc.; Debbie Goldstein, Certified Mediator, Negotiation and Conflict Resolution; Consultant, Triad Consulting; Robin Denise Johnson, Ph.D., President, EQUEST, Inc.; Kathryn S. Keeley, President, Keeley and Associates; Financial Growth Consultants; Beth Polish, President, The Critical Junctures Group; Founding VFO, iVillage, Inc.; Orit, President and CEO, The O Group.The Women's Leadership Exchange Connection is a bonding experience where women support one another, facilitate a break through, and launch one another into seeing the possibilities, feeling the connection, reaching your goals and growing your business!